Your heart is an extremely strong organ, but even this grows weak if you do not take good care of it through a nutritious diet and regular exercise! Here is a list of some of the most “heart friendly exercises” for a healthier blood pump. Yoga requires you to exercise using your own body weight and practice stretching to gain more flexibility in your movement. Yoga ranges from requiring very easy and basic movements like in Hatha Yoga, to demanding great flexibility and perfect posture like in Ashtanga or Vinyasa Yoga. Along with providing you with physical benefits, yoga can also be helpful in clearing the mind and keeping you stress-free. 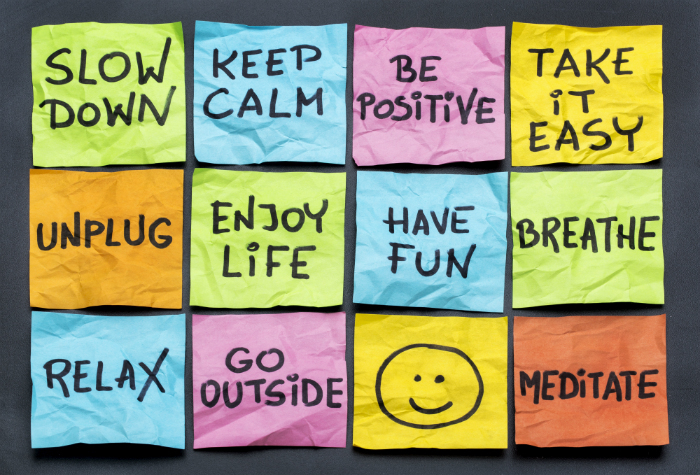 Remaining stress-free is also a really good way to keep your heart healthy and relaxed. Aerobics are basically cardio-exercise. 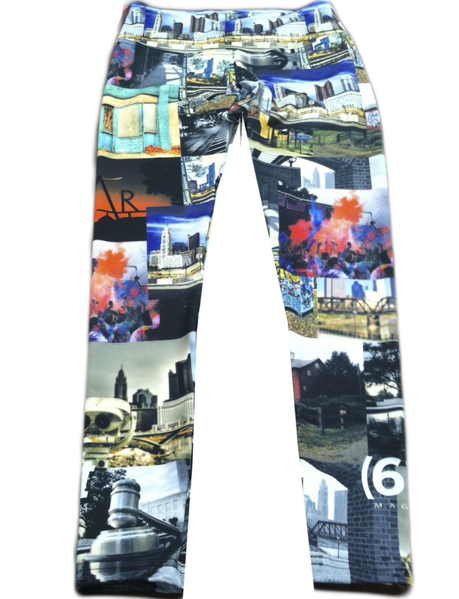 They can be anything that can make your heart rate go up and have the sweat running in minutes. Aerobics are not a good option for people who have fragile hearts since it makes the heart put in a lot of effort. Even so, if you believe that your heart is healthy now and you want it to stay that way, you should get into the habit of doing aerobics regularly. 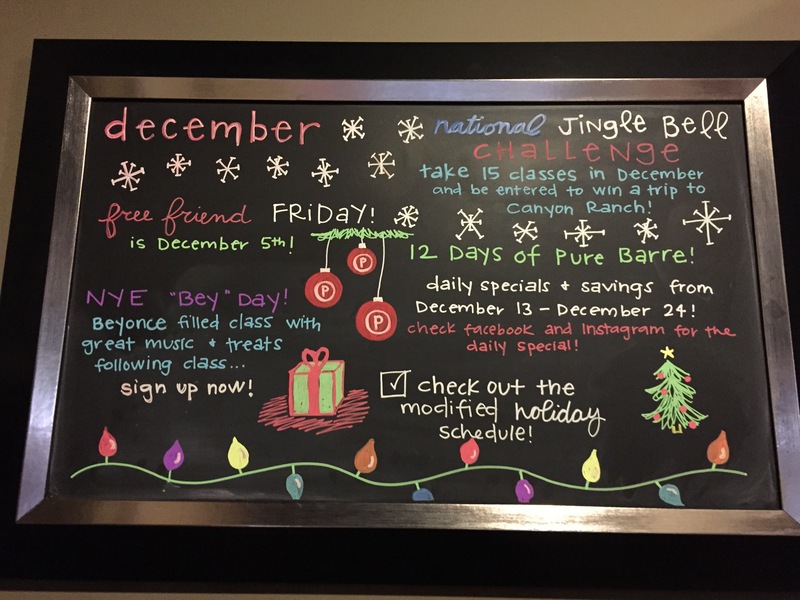 You can make it even more fun by practicing fast dance moves or joining a class with a group of friends. For people who have never really had much physical exercise to begin with, they should start off with walking. Walking briskly 30-60 minutes every day can prove to be a very useful exercise. Even if it does not show immediate effect, you can see some major improvements in your long-term health. When you find that walking briskly is getting easier and easier, you should get the pace up to a jog and then start jogging or running. Running is one of the most effective ways to lose weight and make your heart really healthy. Strength training includes exercises that require lifting weights and doing exercises like push-ups. Be cautious of lifting weights that are beyond your capacity, this may seriously damage your muscles. Instead, take weights that you can use comfortably and do a series of relatively easy weights, working your way up. Okay so massages are not exactly exercises, but they do make your body go through some physical toning which is basically what exercise does. According to the Mayo Clinic, “Studies of the benefits of massage demonstrate that it is an effective treatment for reducing stress, pain and muscle tension.” So get yourself a top quality massage chair! Author Bio: Sara is a psychologist by profession and she loves massage therapies. She enjoys home-based work and traveling. She is obsessed with massage chair therapies and other relaxing techniques. She regularly posts at https://mymassagechairs.com. Disclaimer: We are not doctors, only fitness enthusiasts! Please consult a medical professional before beginning any exercise routine. Hope you all had a wonderful Thanksgiving! We had plenty of time to shop, decorate for the holidays, find a tree, get some miles in with friends and of course, eat! Although many of us may have overindulged in sweets this past weekend, its a whole new week and time to get our sweat on! 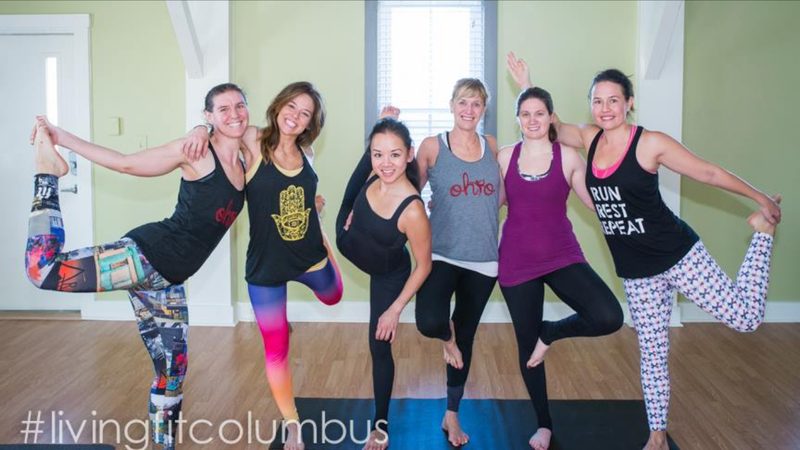 Yoga is one of our favorite ways to cross train for running and we love to hit the mat. One of our readers, Beth Martel, submitted this guest post to get you back into the groove. Winter is usually very rough on our skin. Many people experience dryness, paleness and dullness on their faces. The low temperature, indoor heat and outdoor cold can be damaging on the skin. The good news is that you no longer need to invest in heavy creams and serums for the cure. Yoga is here for your rescue! There are some beautiful yoga poses which can lead you towards fresh and young skin during the cold winter months. Yoga improves your blood circulation and increases the availability of vital nutrients. Increased blood circulation also speeds up the removal of cellular waste and toxins giving a fresh look to the skin. 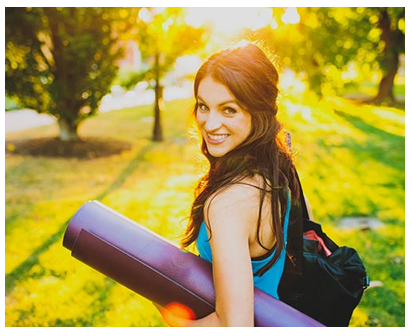 So grab a mat and take a look at these five yoga poses that will help you get that dream winter glow! The child’s yoga pose concentrates blood flow to the face which relaxes the mind. It is like dropping of all your worries on the yoga mat and forgetting all the stressors. Take a few deep breaths while you are in this pose. For doing the child’s yoga pose, bend your thighs and stretch your face ahead just like you are facing the ground. This yoga pose will oxygenate your body and the weight will fall off your shoulders and back. Take about 8-10 breaths in this pose. Take your feet and legs wider than your shoulders and bend down over your legs. Now, touch your arms to your ankles. Sidenote from Living Fit & Pop Sugar: this is a great stretch for runners to get those hammies (hamstrings) lengthened… muscles all too commonly shortened by distance running! In this pose, your blood flow would be reversed and your flow will be greatly increased. This helps reduce stagnation which is common in winter & leads to many skin issues such as wrinkles and acne. Take your feet and legs hanging up in the air and just lie a little on your shoulders. 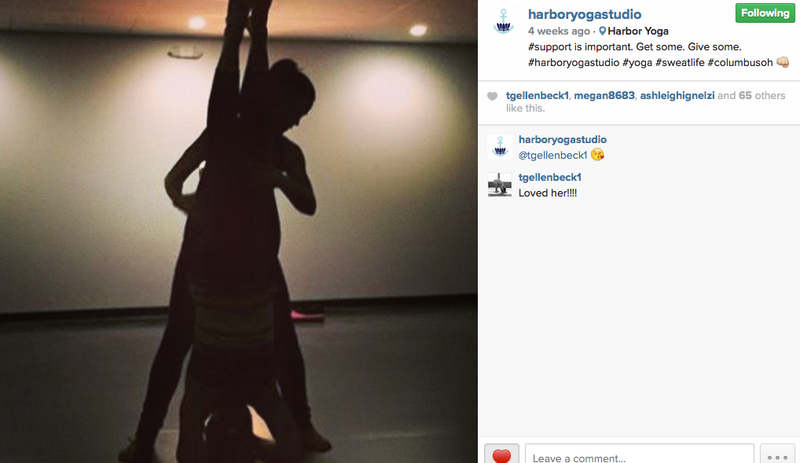 The wheel pose requires you to lower down on all your four limbs. To follow the wheel pose, bend your knees and place your feet flat on the floor. Bring your hands to the place near your face and press your palms onto the ground. In this pose, your elbows would be facing the sky. Keep holding this breath for 10 breaths and relax. The corpse pose (or as we like to call it, Savasan!) is the easiest and the simplest yoga method one can do. It just involves laying on your back and focuses on relieving stress and tension from your body. You will notice that your skin, face, jaw and sinuses are relaxing. For this pose just lie straight on your back and relax! This post was written by Beth Martel. She is a mother of two, a medical professional and a humanitarian. She blogs Amazon reviews and products at HealthyRecharge.com. Some may think selfies are a product of narcissism, but around here, we simply view them as a way to document progress. When I first started practicing yoga regularly in January 2014, I could barely hold a Warrior I without losing my balance. Since then, I’ve hit new PRs of Warrior III [almost on a paddle board! ], Crow, Side Crow and most recently, Headstand. If I can do this, YOU can do this! And this was me [on the right] recently, supporting myself! Progress! I’ve found that I’ve hit a lot of my PRs in running, so yoga has allowed me to achieve new accomplishments physically and mentally. 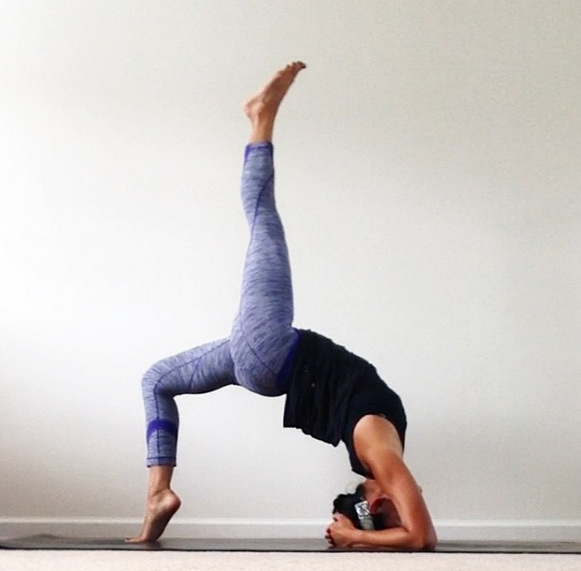 Whatever your yoga goals are ~ flexibility, balance, strength, improved running times ~ why not take photos to visually document your progress along the way?! So what are your waiting for? 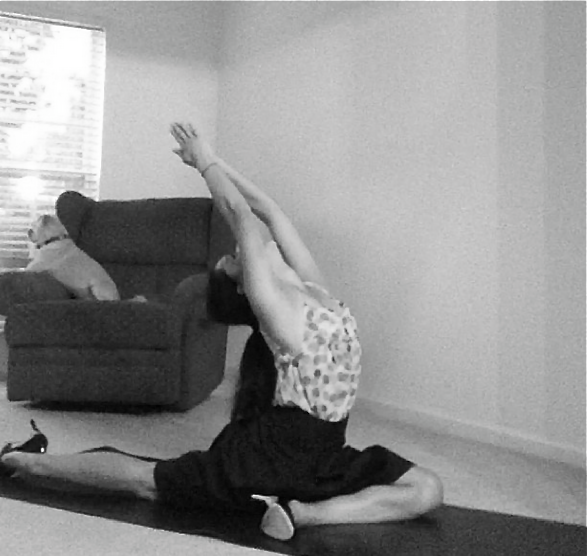 Pick a pose, snap a pic and practice, practice, practice! 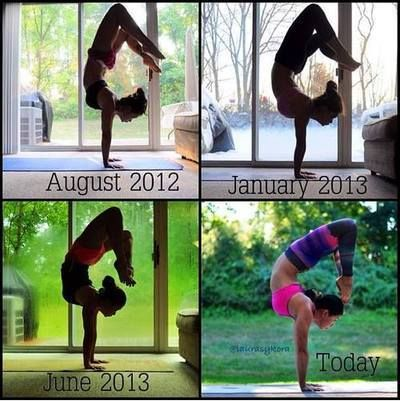 Watching yourself grow as a yogi is an amazing feeling that we assure you’ll be proud of. 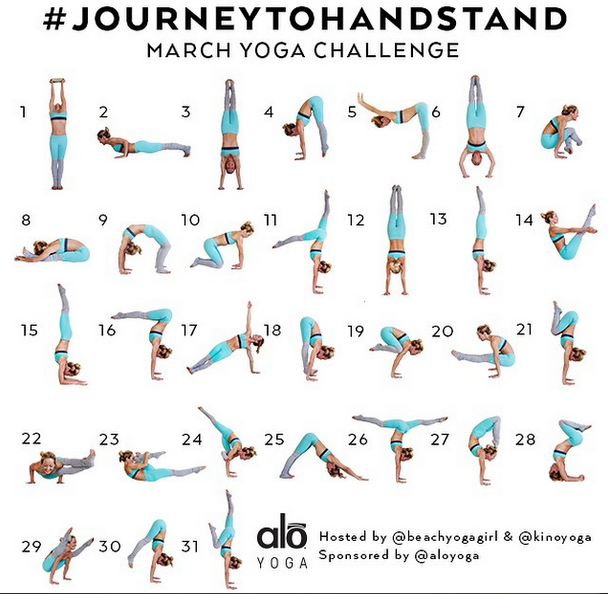 We are participating in Kino & Kerri’s Journey to Handstand on Instagram this month. No ‘beginning’ photos yet, but we are excited to partake in this journey and document our progress so stay tuned! Repetitive Use. Our hip flexors help pull the leg forward and your knee upward during your stride. Think about how many times you do this during a run! You take anywhere from 250-350 steps PER MINUTE when running, depending on pace, so that is a lot of hip flexing!! Weak Glutes. “One big contributing factor to hip flexor tightness is that the glutes just aren’t as active as other running muscles during most activities. This causes your hamstrings, quadriceps, and calves to become much stronger,” claims athletico.com. We also spend a good part of our day sitting, which contributes to hip-tightening. Why does it matter for runners? More flexible hips (and other leg joints/muscles) can lead to more efficient running times and injury prevention. “The strength and flexibility you develop on the mat – namely in the core, quads, hamstrings, and hip flexors – can help you run more efficiently and stay injury-free,” says Adam St. Pierre, a coach & exercise physiologist. Neglecting your hips can not only slow you down, it can lead to injury. 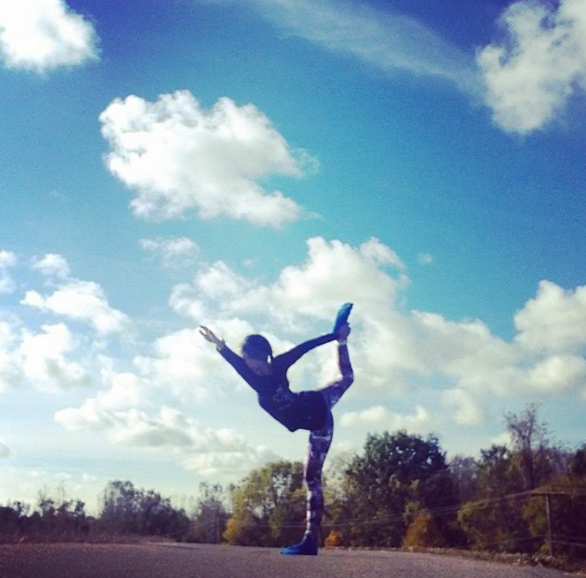 “Like many runners, my thoughts of stretching [used to] range from non-existent to lame. Pretty pathetic! No wonder I had more than my share of injuries in those years, mainly in the hamstrings and hips” states Christine Felstead, a yoga instructor that works specifically with runners & performance athletes. In her book, Yoga for Runners, Felstead names chapter 10 ~ Hips: Unleash the Power ~ where she talks about the overall improved running performance and efficiency we can achieve through a little hip love! How can we work them? 2. Quad & IT rolls on the foam roller. If you don’t have one of these bad boys and you are running distance, get one NOW! 3. Get up and MOVE during the day. The less sitting, the better. 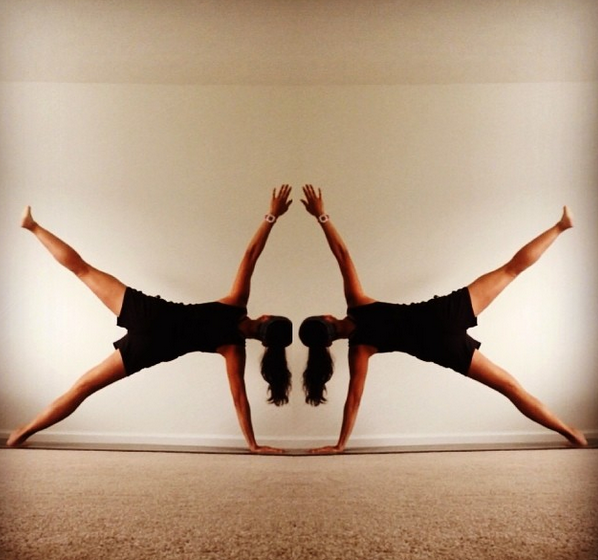 Three yoga poses we like that require hip flexibility… good goals to work towards! 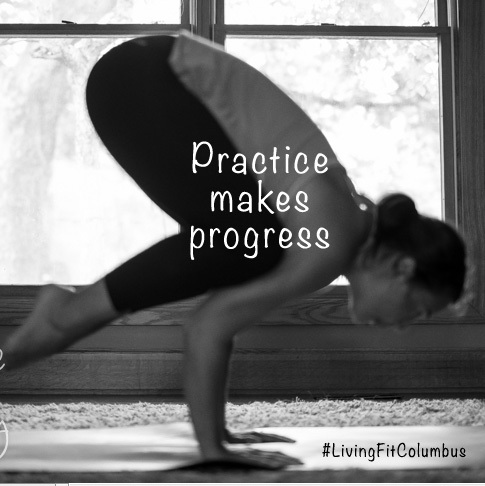 Side plank with variation… we want to bring that leg up all the way someday! More to come after our running clinics. Stretch those hips and stay fit! 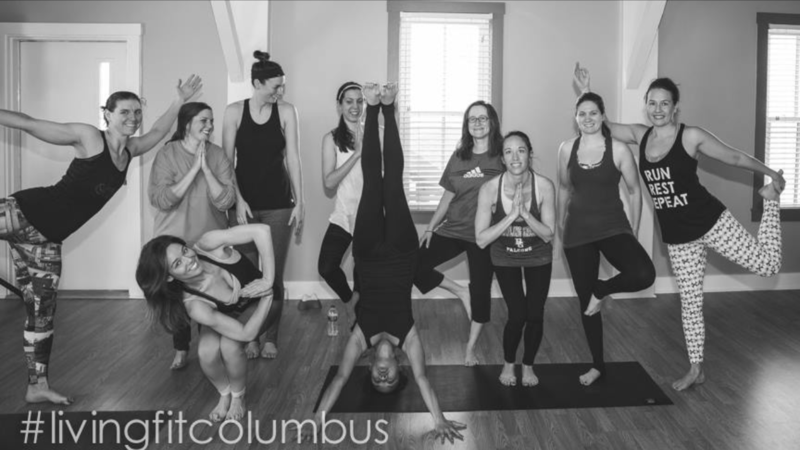 We enjoy traveling around Columbus and trying new studios, new styles of yoga and of course, meeting other fitness lovers. We struck gold on this studio tour! 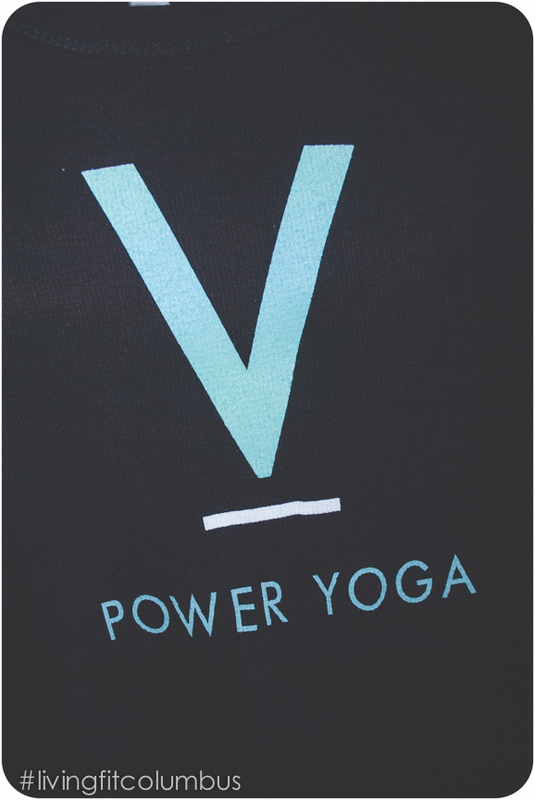 Four of us attended a class at V Power Yoga last Saturday morning and unanimously, we can’t wait to go back. 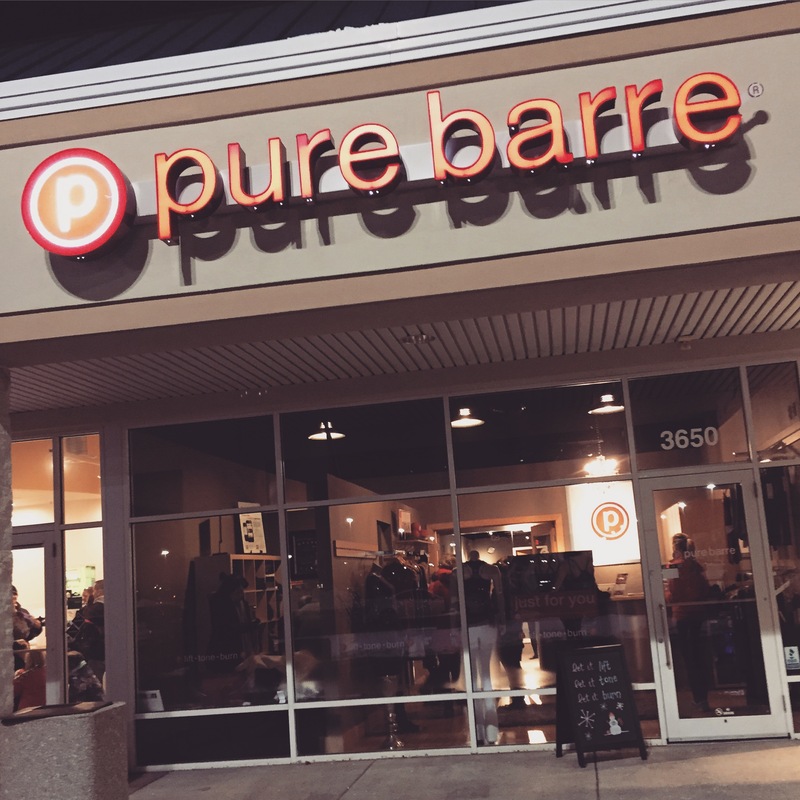 We first heard about it through Rachel Kerr from The Beauty Barre and then found it on our recently acquired ClassPass Columbus. This morning it was rainy. I don’t mean just a sprinkle, it was a pouring monsoon out! 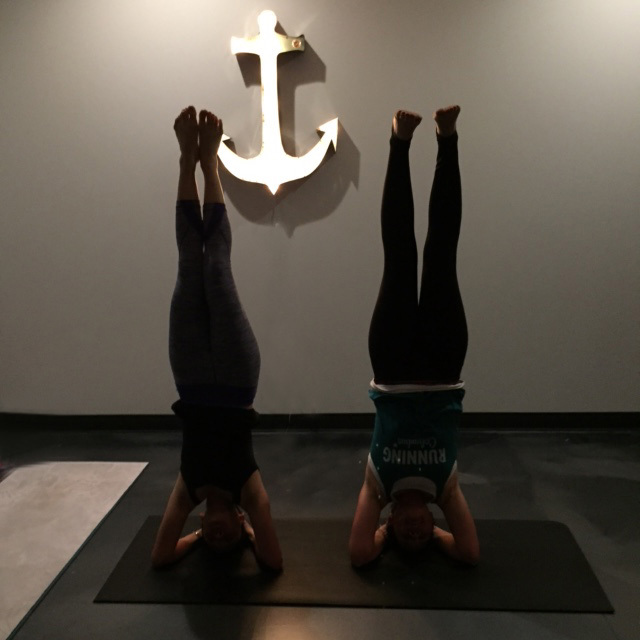 That didn’t stop us yogis from going to an 8am heated yoga class. 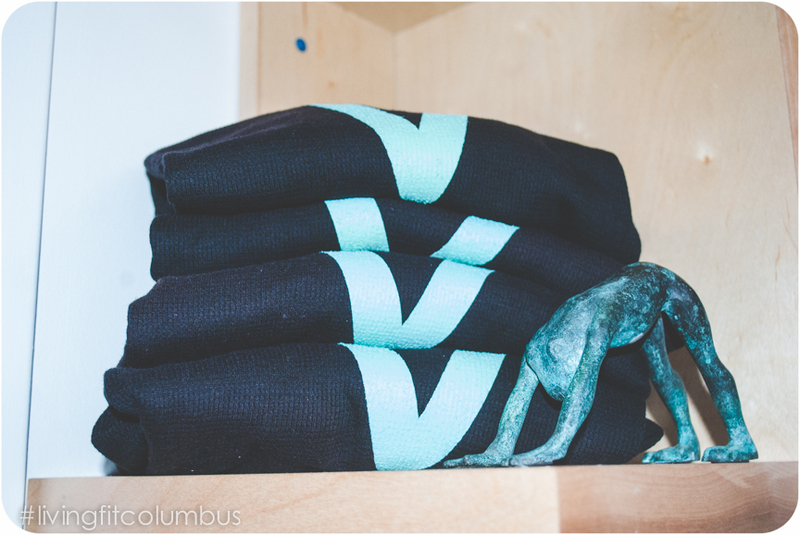 This month, we are trying out ClassPass and decided to give V Power a whirl. I had never been to this studio before, and have only heard amazing things. Naturally, on a Saturday morning, any normal person would sleep in. I was so excited to try this place out that I was up close to 6am! The class, itself, was a power flow. Great for any morning energy! Erin (our instructor) started the class out with slow stretches to get our muscles juicy and warmed before jumping into our vinyasa flow series. 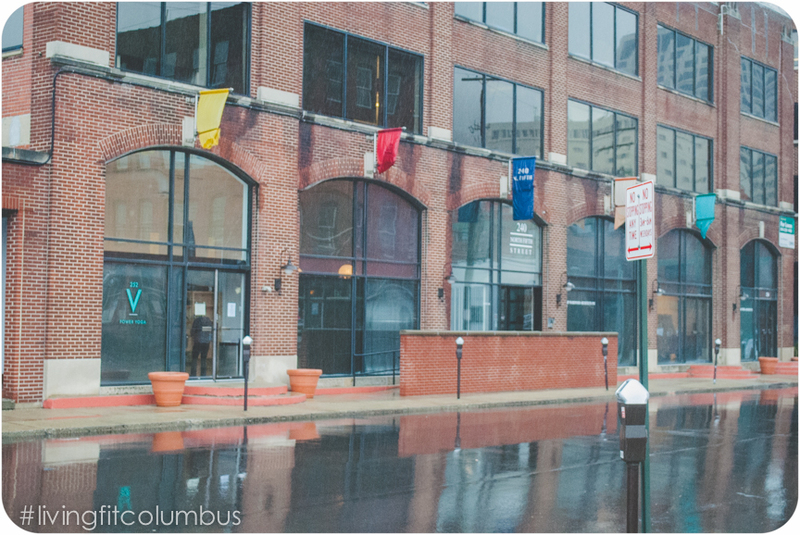 The class was heated and it felt SO great coming in from the rainy cold! I especially loved the energizing music – it makes you just want to dance! The hour went by so fast- it was 9am before we knew it. As with any heated yoga class, I took advantage of being warmed up and practiced my scorpion before leaving. Erin provided very helpful tips post-class [ie, to not be scared to keep bringing my feet to head in forearm scorpion]. I wished we lived closer, but will definitely be coming back! 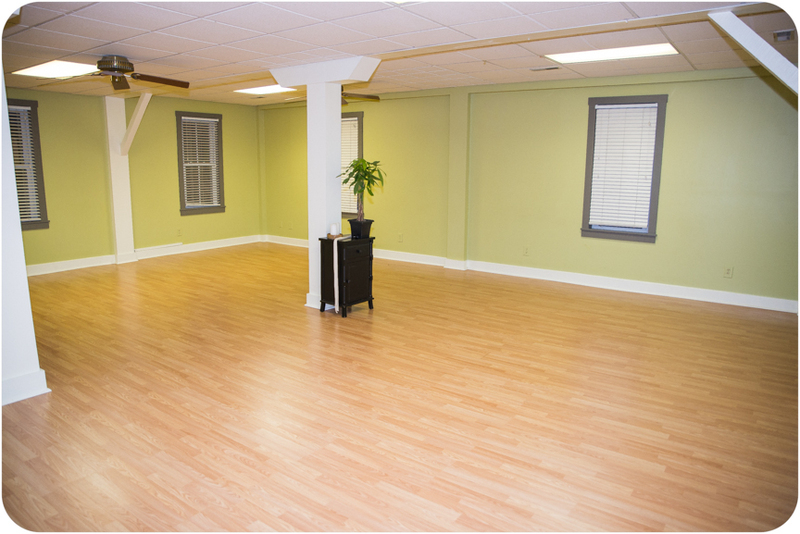 This was my first yoga studio in the downtown/warehouse area. I was not up at 6AM like Lan, but I was excited! 🙂 We got there about 15 minutes early and were the first to arrive. The instructor, who we later found out was one of the new co-owners, greeted us with smiles, got us checked in and moved us into the studio. The heat. It was a heated class (which I love, especially in winter), but not TOO heated. We all broke a sweat and were nice and warm, but weren’t dying. Room to move. 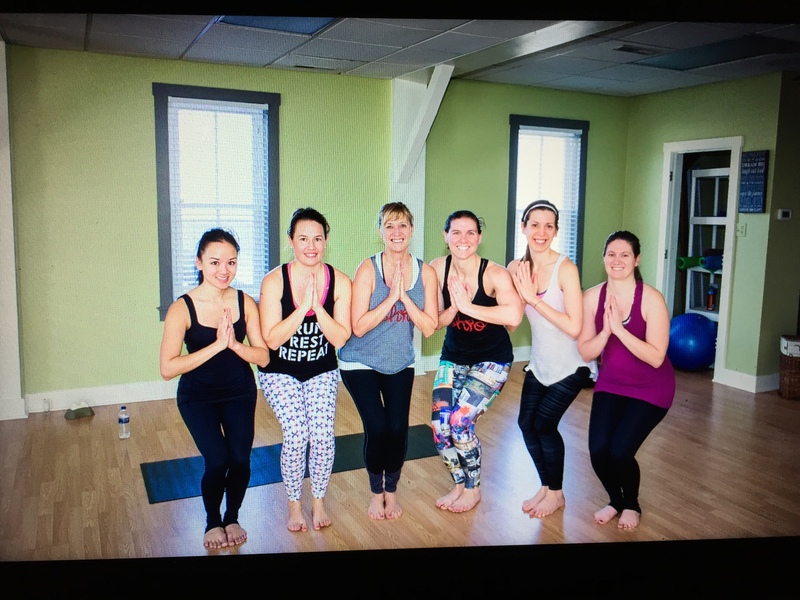 The class was full on the website (a few of our yogis didn’t get in! ), but there weren’t a TON of people packed into the class. It was nice to have arm room. This likely means to sign up early! The instructor [and co-owner], Erin, was amazing!! She was nice, easy to hear and very good at giving instruction. She moved around the room and helped people with modifications, congratulated yogis on their poses, etc. She gave us some ideas for hip stretches (as runners, they tend to always be tight), chatted with us after class and encouraged us to come back. We will!! It was the perfect combination of my favorite studio, Harbor Yoga, and other studios that give you a bit more time to practice certain poses [like PAI]. The first half was very fast flow, upbeat music, quick sequences, a great cardio/power workout. The second half was a bit slower and gave us time for play, something I love as a new-er, wanna-be yogi. Their site describes their practice as ‘vigorous and athletic.’ My type of workout! The only downfall for me personally is the location/drive time. Since we live in Dublin, it took about 20-25 minutes to get there, so round trip, it was about a two hour expedition ~ great if you have a lot of time, but a big chunk if you’ve got a long daily to-do list. 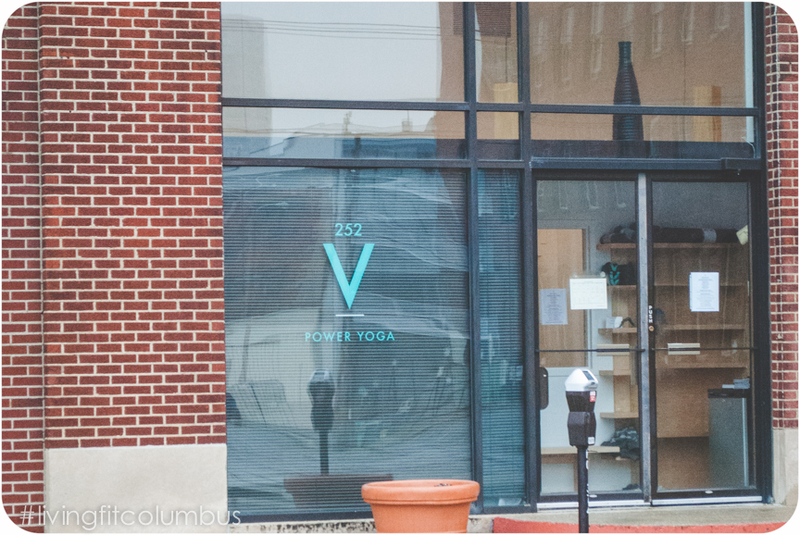 V Power Yoga is nestled in the warehouse district of downtown Columbus. Reservations are not required, however new students are encouraged to arrive 15 minutes before class. Loaner mats are available for $3. Loaner towels are available for $2. Overall we LOVED it and will definitely be going back. You should really check it out! 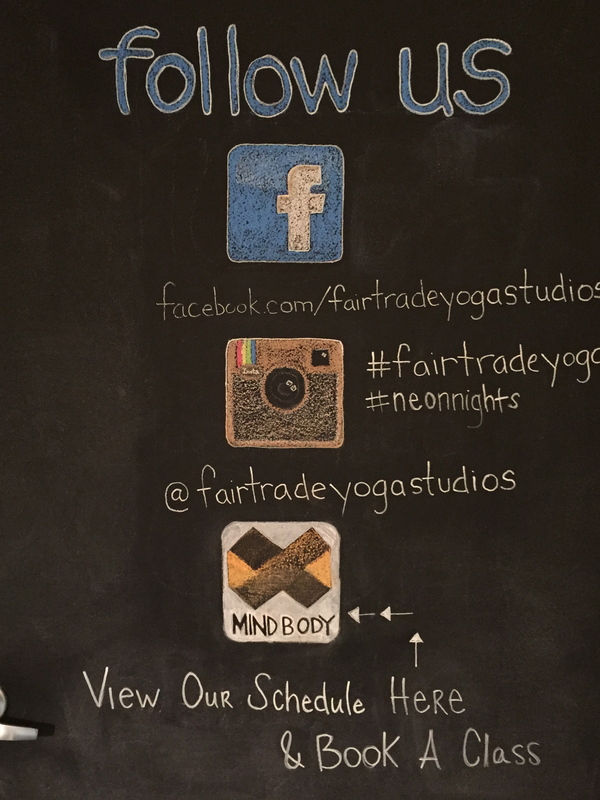 We first met Sherry Hoff, owner of the new yoga studio FAIR TRADE YOGA, at our Run+Yoga event at Bend Active a few weeks back. She kindly donated her time to offer a yoga session after our 3-4 mile run! Where the magic sweat happens! 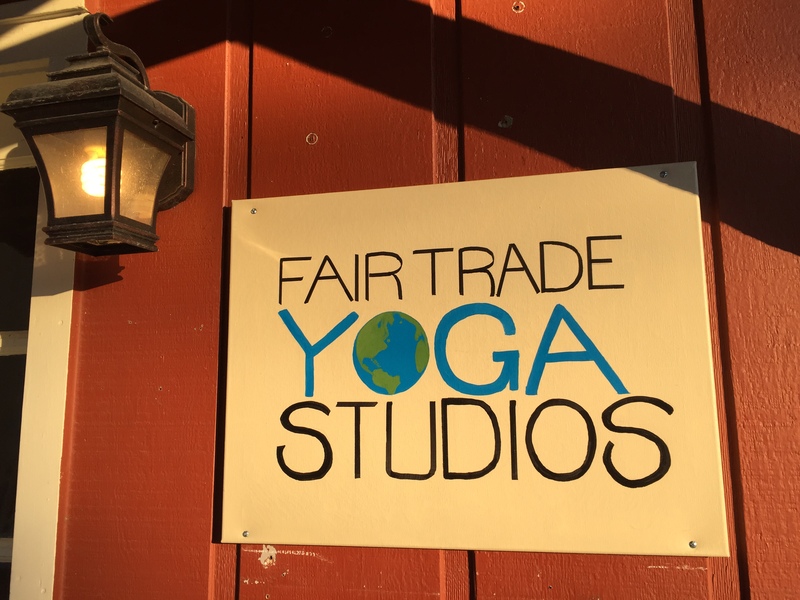 Fair Trade will offer a variety of classes including heated [85-95 degrees], Power Vinyasa, Ashtanga, Slow Flow, Restorative, Guided Meditation and even kids’ classes. 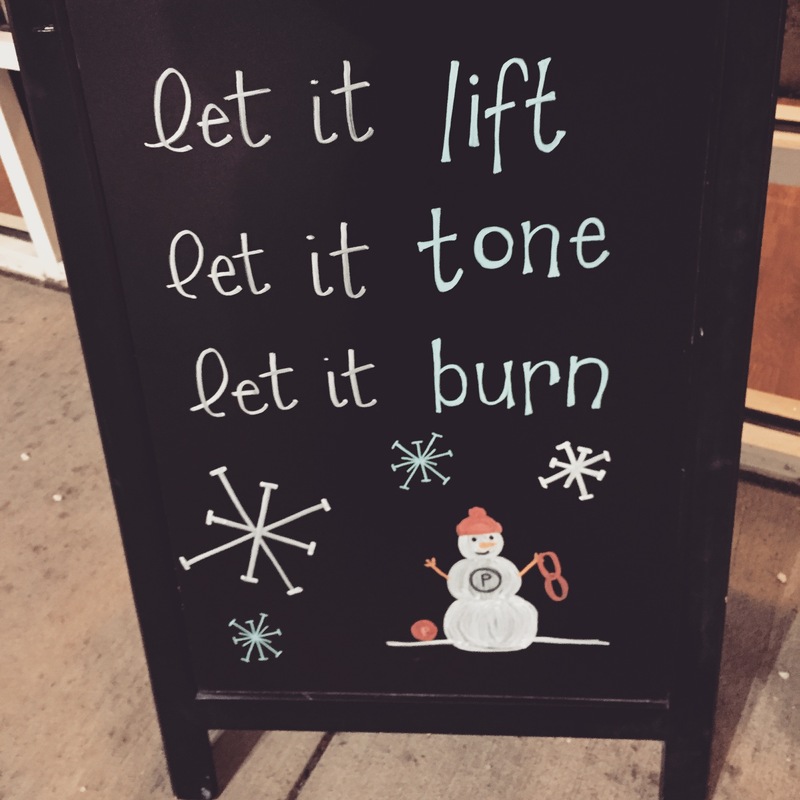 I also got to meet up with Rachel Kerr, owner of The Beauty Barre [over coffee, of course!] 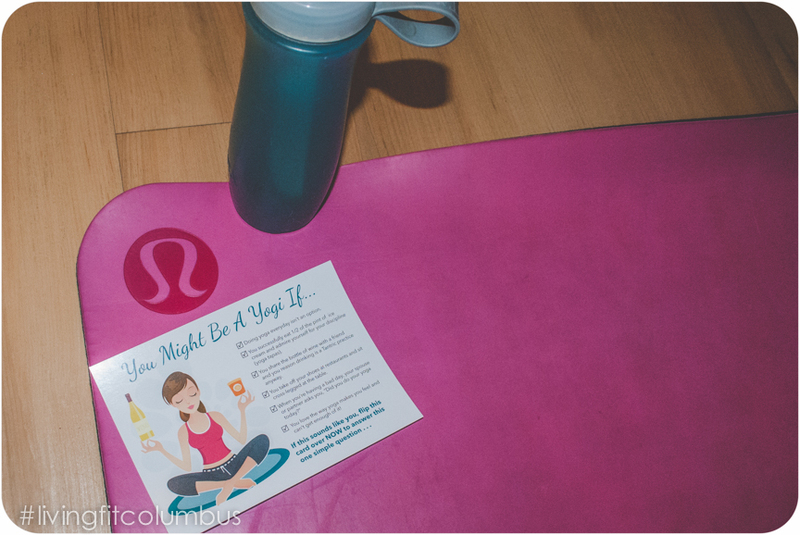 She is a super sweet yogi, deserving of her own blog post all together [stay tuned!] 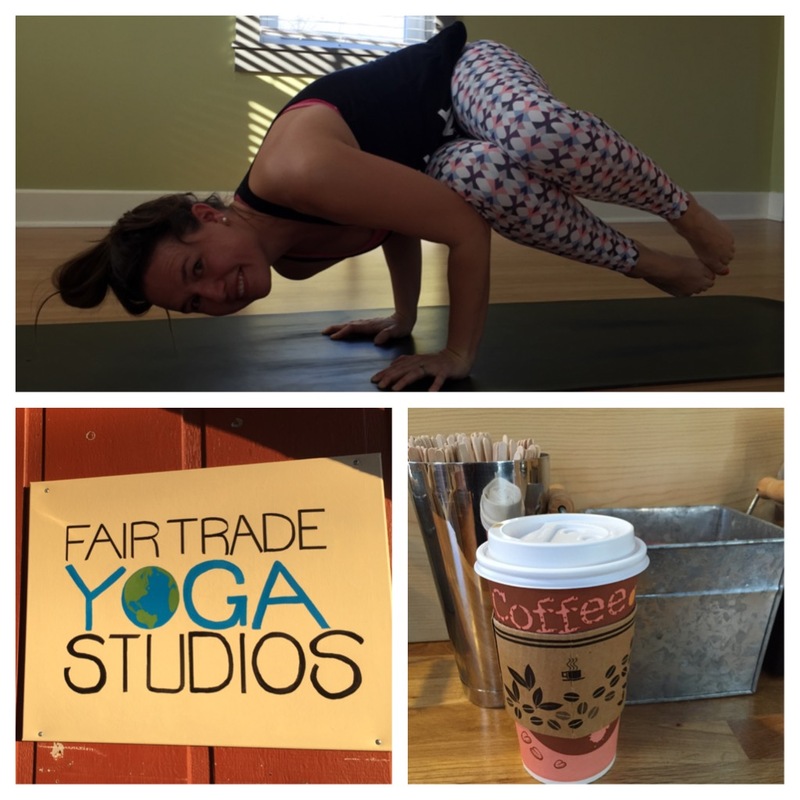 Rachel will be teaching at Fair Trade and offers a power vinyasa style. 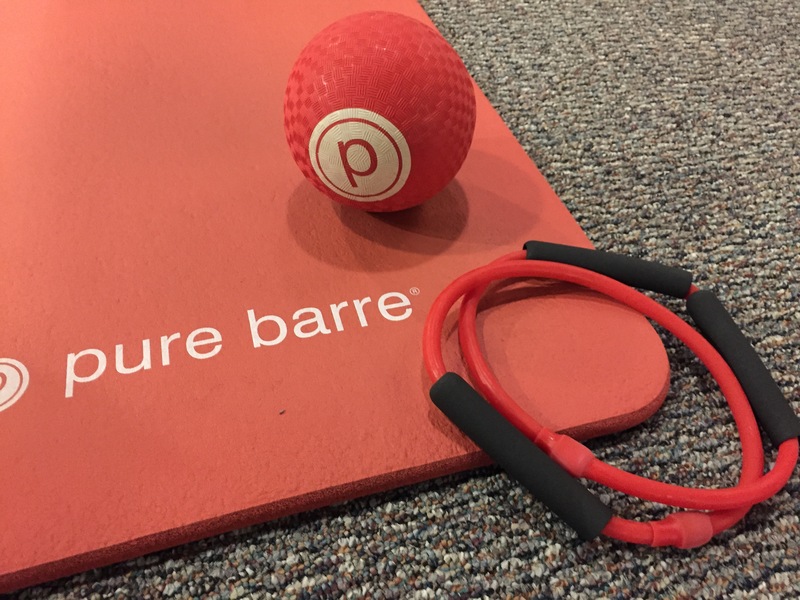 She likes a fun, powerful workout, upbeat music and encourages you to sweat, sweat, sweat! 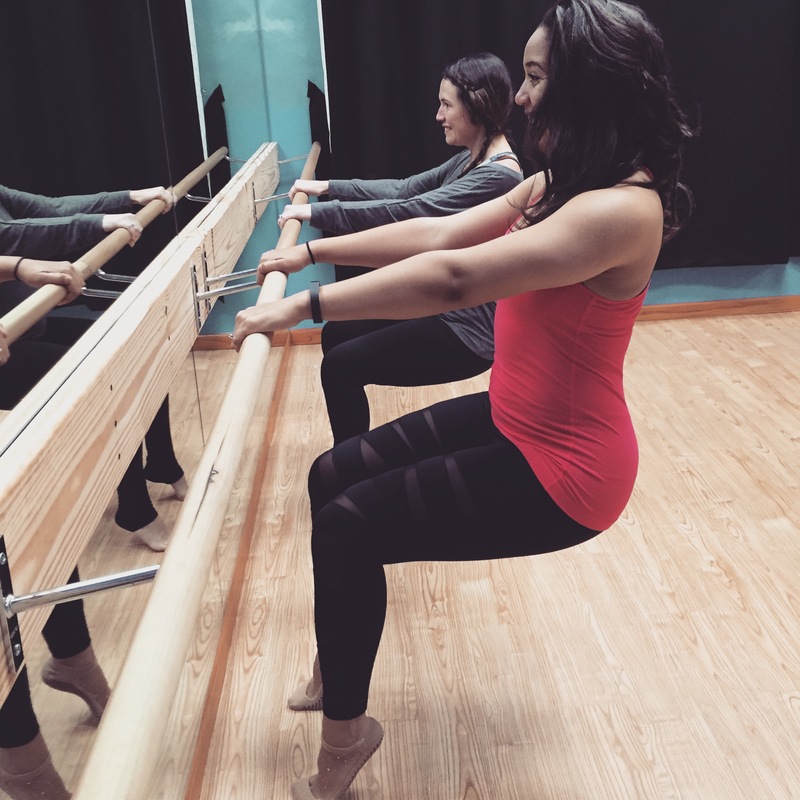 Looking forward to taking her class and getting to know more about The Beauty Barre in 2015. 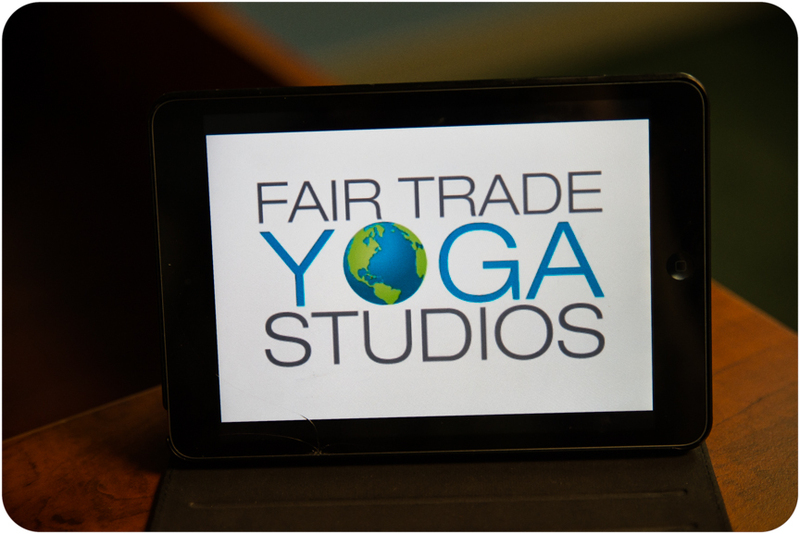 Fair Trade Yoga Studios has its Grand Opening Event this Sunday, January 4th from 1-4PM. 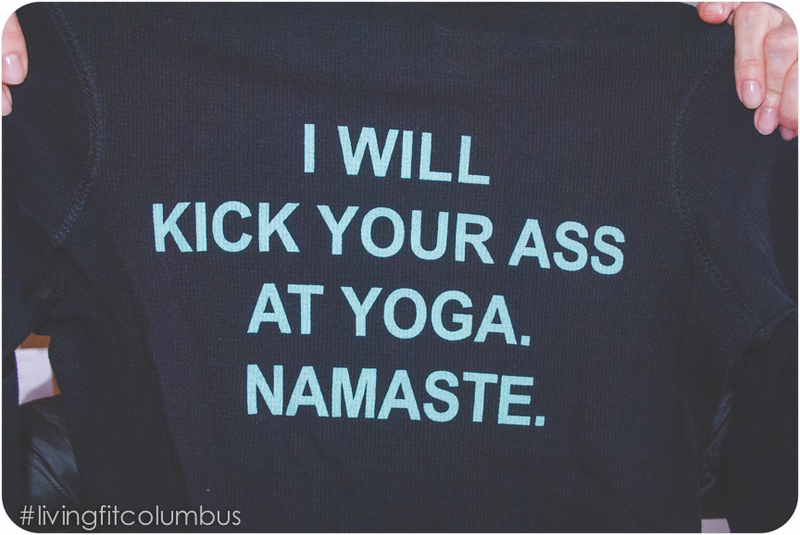 The studio is located @ 36 North Liberty Street, Powell, OH 43065.
giveaways & door prizes ~ one lucky yogi will win free yoga for ONE FULL YEAR! To RSVP to the event [and be entered in the giveaways] email Sherry @ yogabysherryfair@gmail.com. 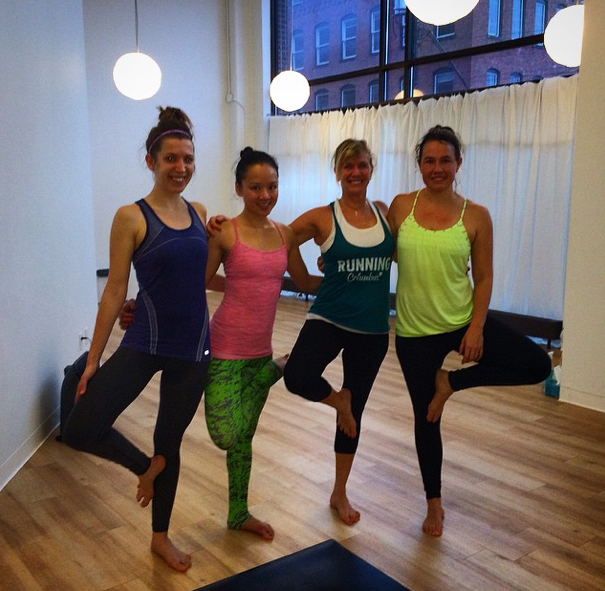 We took our first Vinyasa flow class with Sherry on a Saturday morning in January . It was a great class and we hope to return many times. There is even a jogging trail nearby, so a run+yoga day perhaps?